The Logue brothers were all smiles. So were their teammates, coaches, family members, friends, and fans. During Father Judge’s decisive, 50-12 victory over visiting Archbishop Ryan in the Catholic League wrestling championship Jan. 29, the Crusaders captured 11 of the 14 matches. Three of them were secured were by senior Liam Logue, junior Eamonn Logue and freshman Sean Logue. 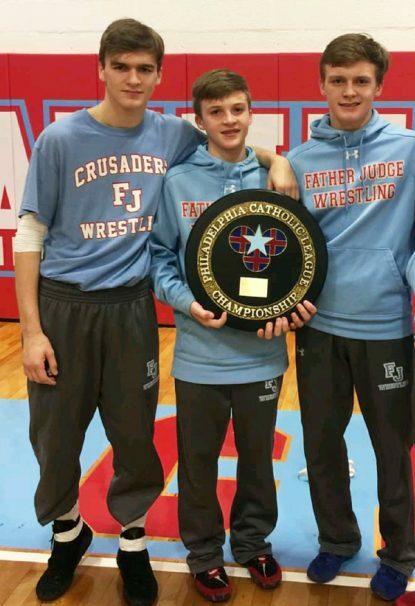 According to several Catholic League wrestling historians, it is the first time that three brothers have contributed wins for a CL championship squad. When he leaves for the Coast Guard Academy, where he will wrestle, Liam said he will never forget being a major cog for a program that has taken three of the last four crowns and four of the past six under the tutelage of coach Jim Savage. This title, of course, was his most special because it heavily involved his only siblings. Sean got things started with a decision at 106 pounds. After a technical fall by junior Max Edwards at 113, Eamonn pinned his 120-pound opponent in only 36 seconds. Next up was Liam, whose major decision at 126 increased the Crusaders’ lead to a whopping 18-0. Before the night was over, freshman Michael Palinkas (132), senior Robert Lawlor (145), senior Caesar Fountain (152), junior Danny Wildonger (160), junior Brenden Spicer (170), junior Matt Kidwell (182) and sophomore Jose Lage (285) would also have their hands raised in triumph. “Winning the championship together was a great experience, emphasizing how important the daily hard work we put into wrestling is,” said Liam. “Through wrestling we are close. Whenever we went to new practices it was always good to have some people I already knew. Eamonn said being the middle child did not necessitate any Jan Brady meltdowns (look it up … it was a classic television show during the ‘70s). “It is awesome because you get to act both roles,” said Eamonn. “You’re inspired by your older one and follow his lead, and you get to inspire your younger brother and help him learn. Sean admitted to some angst when high school started because if he had not started on varsity, the trio would never have another opportunity to create such a distinctive lifelong memory. But Sean forged his reputation early. He won his first match in the season opener, a hard-fought, 40-33 Judge win over Council Rock North. In fact, he did it in style, his major decision at 106 mathematically clinching the win. “With both of my brothers making varsity all of their years, it did put some pressure on me to go varsity,” said Sean. “I often train with my brothers, so I felt pretty confident I could make it. And what did the Logue brothers do to celebrate the historic event? Hope their sandwiches were at least on classic-sized roles. John Knebels can be reached at Jknebels@gmail.com or on Twitter @johnknebels.